I was recently wrapping up a shoot and thought back to a time when I was a student intern who was tasked with the chore of pulling and coiling up coaxial camera cables. Although this sounds more like busywork than learning a marketable skill, it was a surprisingly valuable learning experience. Although the task sounds relatively simple, I learned (the hard way) that there is in fact a correct way to wind up cable. Before I was taught the relatively simple “over-under” method, I was personally accountable for the death of several thousand feet of cable. When it comes to broadcasting and mission-critical broadcasts, one dead camera cable can bring an entire production to a standstill. Improper coiling is usually a death sentence for lower-priced coaxial cables with stiff cores. One way to mitigate this is to either use more expensive cables with a flexible core, or simply switch to a wireless solution. In a perfect world with unlimited wealth and ideal circumstances that exist every minute of every day, wireless cameras in a production workflow would add to that perfection. Unfortunately, we do not exist within such perfection and no production scenario is ever totally predictable. However, even if we did exist in such a place of perfection, would today’s wireless video solutions still be ideal? Although point-to-point video transmission has been around for quite a while, it wasn’t until Teradek unleashed their Bolt into the market, that wireless video transmission became relatively affordable. As someone who has used (and sold) the Teradek Bolt, I can confidently say this is a great tool and useful in a variety of ways. However, as useful as the Bolt is- it was not without its shortcomings. Breaking it down to a dollar per foot standpoint, the Bolt Pro 300 costs roughly $6.00 per foot (based upon it’s 300ft. maximum range) to operate. Compare that to a high-quality coaxial cable that can handle also handle 3G SDI signal at similar range, and you are looking at only $1.25 per foot. From a dollar to foot comparison, the “older” way would appear to have a significant advantage, but is that the entire story? Despite the significant price variance between a traditional cable and a point-to-point wireless solution, advancements in technology have made it possible to have a middle ground solution. Basic video over IP has been around since the 90’s, but advancements in video encoding have made it possible for HD video to easily stream over lower-bandwidth connections. Video over IP makes it possible to not just share video across a local network, but as most of us have experienced in our own homes- video can also be shared across the internet. Equipment manufacturers have seen the potential in IP video and are now building entire workflows around this technology. JVC has been a quiet leader in IP acquisition by building video encoding technology directly into their cameras. This means that a JVC camera (which supports encoding) connected to a wireless network adapter, can stream its video output over a wireless network to a decoder, whereupon a producer can add that stream into their production. Since encoding and decoding can occur within a piece of software, the physical cost of equipment can be greatly reduced. Depending on the strength of a wireless network within a facility, the wireless range of a camera can be easily increased. This gives IP a distinct advantage over point-to-point wireless or a coaxial cable, as those provide fixed distances. Another advantage of cameras over IP is that multiple cameras can exist over the same network, giving more flexibility to camera placement. Additionally, there is a significant cost savings that comes with IP video as well. Even if you needed to purchase a standalone encoder (if your camera lacks an encoder) and decoder, you would be somewhere in the $4.25 per foot range (based on the previous 300ft. distance). This cost can be reduced, since IP video you can allow you to go much further away from your video switcher and hardware can be substituted with software. So, what’s the catch? As most of us have experiences in our own home or offices, wireless can be unpredictable and connecting to the network can become difficult at times. Network traffic and slow routers can also make IP video acquisition a bit tricky as the video may have to be buffered prior to acquisition- leading to additional latency in the video feed. Depending on the production or workflow, this may not be a deal-breaker, but it is a factor worth considering. So, as we strive to find ways to cut the cable in our productions, new technology gives us viable options to consider for our workflows. Although it may appear that a traditional coaxial cable might be a winner based upon price, considerations need to be made for the extra space and increased weight that go along with larger spools of cable. This can negate the initial savings as shipping and transportation costs will increase with the extra heft of carrying cable- especially if you have any spare cable with you as well. Point-to-point wireless may have a higher initial cost, but offers very little latency. 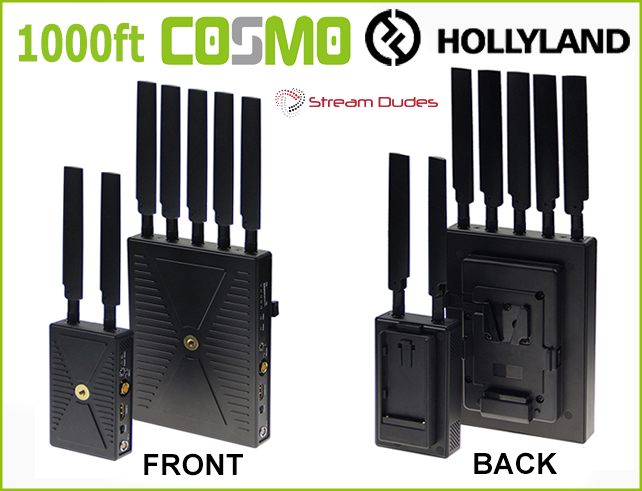 The Hollyland Cosmo 400 is a newcomer to this segment, but offers solid range (OVER 400ft.) and at more competitive price point. I remember the first time I tested this unit, it was very easy to set up and sent an HD signal through two entire floors in our office building without a dropout in signal. Needless to say, I was very impressed with the performance of the unit. If you can ensure that you have a solid network connection and latency isn’t too much of an issue for your broadcast, then IP video offers the most flexibility for the money. With the advancements NewTek is making with their NDI technology, latency and connectivity issues are almost a thing of the past and proof that IP is the way of the future. I know that navigating trends in video streaming and production are difficult, which is why I co-founded Stream Dudes with Kris Lang. Together, we can help you find the right workflow for your productions, and provide answers to your questions.